Louisiana DeLorme Atlas: Road Maps, Topography and More! 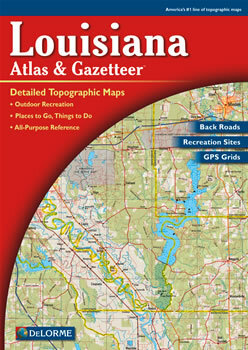 Explore Louisiana with 49 large pages of detailed shaded relief maps in the DeLorme Atlas and Gazetteer! The atlas has so much to offer with an extra 15 pages of details regarding Kentucky's activities and points of interest. This reference information includes: attractions, museums, historic sites, scenic drives, canoeing, hunting, fishing, golf courses, gardens, natural and scenic rivers, campgrounds, trails, recreation areas and unique natural features. The back cover of this atlas has a large map of Louisiana with an overlying grid. Each cell of the grid contains the page number for a detailed map of that area. In addition, the atlas has an index of the state's place names and map features for easy look-up. The detailed maps in this atlas show both physical and man-made features. These include: rivers, lakes, reservoirs, creeks, bayous, bays, islands, forests, place names, airports, railroads, oil and gas fields, roads, highways, interstates, wildlife management areas and parks. State-wide topographic information is shown by contour lines with intervals of 60 or 120 feet, depending on the terrain. You will be impressed with the details and extras that the DeLorme Atlas and Gazetteer has to offer!